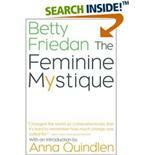 Review: It's common wisdom to think of the Feminine Mystique as a classical feminist text. This is perhaps the case, but I would like to argue that it is so much more than that. The book examines what society tells women about their lives -- education, career, family, sexuality, goals, values, and anything else. The book discusses what society tells women, who exactly promotes these views about femininity, out of what possible motives, and what toll do these views have on women, their family and their children. The basic thesis of the book is that femininity has been mystified, manipulated, and taught back to women, in their homes and schools and churches, in the novels and magazines they read, etc -- that this mystification of femininity is a monsterous distortion of a person's life, resulting in emotional problems, marital and family tension, stifled careers, and general unhappiness... That we -- society -- have been living in denial of the condition women have been manipulated into, and therefore have been ineffectual in our help. That there are good reasons why things are the way they are -- it's embarassing to discover just how economically profitable this distortion is.